If you need to protect a sensitive document, Microsoft Office 2007 makes it easy. 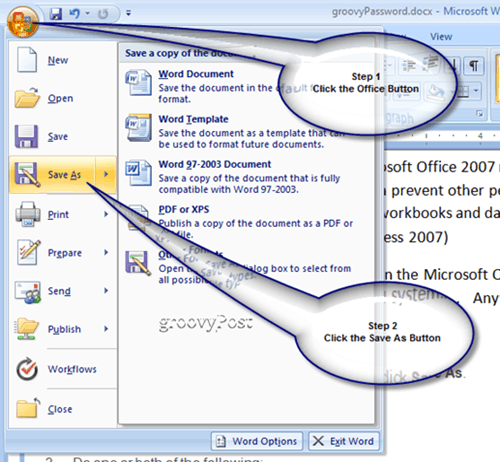 By following the simple step by step process below you can easily Password Microsoft Word 2007, Excel 2007 and PowerPoint 2007 documents (and even Access 2007, however, that’s a separate article). Using passwords can prevent other people from opening or modifying your Microsoft Office documents, presentations, workbooks and databases. Although much of this functionality was available in the Microsoft Office 2003 Suite, Microsoft decided to change things around a bit with their new menu system. Follow these simple steps for .doc .xls and .ppt files. 2. Click Tools, and then click General Options. If you want reviewers to enter a password before they can view the document, type a password in the Password to open the box. Password to modify This feature does not use any encryption method. It is designed so you can collaborate with content reviewers you trust. Is not designed to help make your file more secure. It’s a nice way to allow people to VIEW the document but restrict them from making any changes. It’s coming…. It’s coming… Stay tuned! Excellent! If your ever looking for another answer to something or need some free Tech support, please feel free to post in our free Forum area! This was the most helpful site that dealt with my question. The grahical illustration was the best. Thanks and keep it up. THANK YOU for the feedback! Glad you enjoyed the Article! Thank you for the help! It really is a GREAT article. I have tried all the options, password to open and password to modify and both at the same time with different passwords for each option and mailed as a attachment the document to another e-mail address (to test this). Yet i had access to edit etc and was not prompt for a password? I followed the instructions above….what am i doing wrong?? I tried it again. I am prompted to enter password before opening the file and this works fine. Thank you. How ever when prompted for the editing password with the option of read only i chose read only. 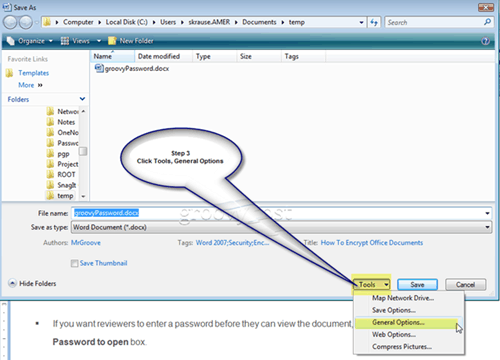 I can still edit and alter the document without entering the password and choosing read only. Can you enlighten me please? @Carl – To prevent the comments section from filling up with Questions and Answers, I have moved your question into the Forum where we can continue the conversation. Please click this link to see my answer to your questions. Comments are being closed on this article. Any further QUESTIONS or COMMENTS can be posted in our Free Community Tech Support (and groovy) Forum.